Imagine enjoying the surf and sun that California has to offer and then coming up against this thing. Sunbathers in Oceanside, California suddenly had to share the sand with this giant sea serpent last week. 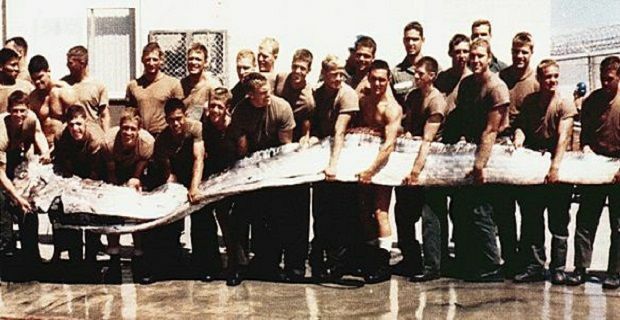 The rare sight that got everyone’s attention was 14 foot long (4.3 metres) when it washed up on the beach but it wasn’t the biggest Oarfish the southern Californian locals saw that weekend. The giant oarfish is rarely seen because it lives at depths of 3,300 feet (1,000 metres). It’s the longest species of bony fish and although it’s a giant it’s no threat to people as it only eats tiny plankton. Only two days later a snorkeler near Catalina Island came across another. This one was 18 foot (5.5 metres) and it took 12 people to get it ashore. The sighting of two rare fish within a couple of days is worrying because it could spell trouble for the area, but it doesn’t necessarily mean that there’s been any ecological disaster – the locals are taking it as a sign that an earthquake could be on its way. Iconic Christmas trees across the pond for fans of the festive season to visit.